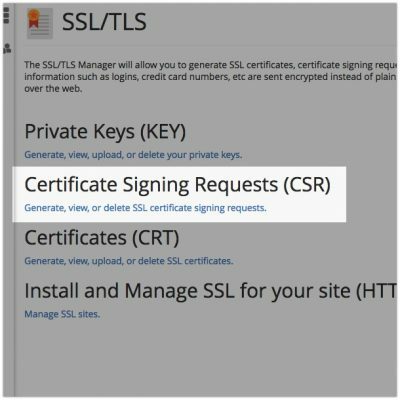 A certificate signing request (CSR) is a crucial component in the creation and authentication of an SSL certificate, and every retail SSL certificate is created using one. Depending on the method or utility that you use to purchase an SSL certificate you may not notice that you are creating a CSR, but you will always end up creating one as the actual signed certificate that you use is created from this CSR. Every SSL certificate has an associated private key and this is also generated alongside the CSR. This means it vitally important to remember where you created the CSR so that you can later retrieve the private key when you go to use the signed certificate if choose not to record the private key (PK) yourself. How do I create a CSR? The easiest method to create a CSR is using the SSL/TLS module within cPanel, as this handles the creation and storage of all certificate components for you. You can easily return back to this module to view the private key and/or CSR at a later date if you need to. Log into your WP Hosting customer profile, and navigate to the cPanel for the service that corresponds to the domain name you’ve already determined. 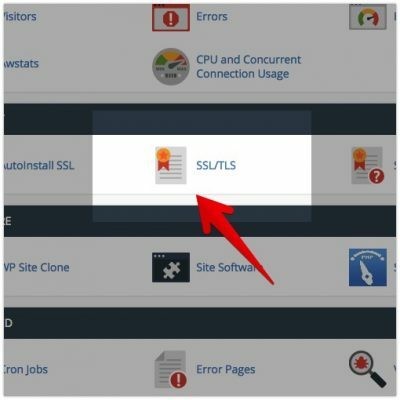 Navigate to the SSL/TLS module, which you will find in the Security group. 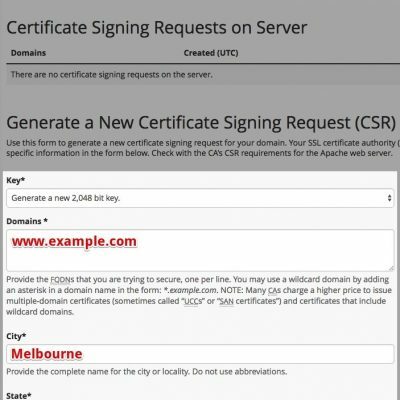 Find the ‘Certificate Signing Requests (CSR)’ heading then click Generate, view, or delete SSL certificate signing requests. Once this page has loaded fill out the form to create a new CSR using the contact details of your preference. Only the items marked with an * are required. Important Note: In the ‘Domains’ field – ensure that if you are creating a certificate for use with a website, always use the convention of including ‘www’ with your domain – ie. ‘www.example.com’. The SSL certificate will be bound to the domain that you enter in this field, with the ‘www’ sub-domain being the only exception to the rule (the certificate will use ‘www.example.com’ and ‘example.com’. Once completed you should receive a message such as this that your CSR has been completed, and the CSR will be displayed on the screen for you to use with the certificate provider. With that completed you can scroll to the bottom of the page and select Return to SSL Manager to finish the CSR creation. The Private Key linked to your newly created CSR can now be viewed and/or downloaded from the Private Keys (KEY) option. 1. What is a CSR (Certificate Signing Request)? 2. How do I create a CSR?